Earthquakes due to fracking, etc. 59. In this regard, a foresight showed that already from the first round of voting onwards a massive electoral fraud had been launched in favour of Emmanuel Macron against Marine Le Pen, which will bring a fraudulent victory for Macron in today’s run-off election, whereby certain EU-dictatorship elements and French EU-dictatorship fanatics are the originators of the whole thing. Limited number of NEW copies of “And Still They Fly” for only $85! They sell on Amazon starting at $246!!! This book – now no longer in print – has already become a collector’s item…selling for well over $300! It contains information from the Plejaren – published three years before the “official” discovery of Apophis – about the dangers our world faces if we don’t prevent its impact. Here is more proof positive that Meier is the only authentic extraterrestrial contactee. When And Yet They Fly! was first introduced more than two years ago, it set the standard for a clear, concise and readable introduction to the extraterrestrial contacts of “Billy” Eduard A. Meier. In simple and easily understood language, author Guido Moosbrugger brings this largely untold story alive with eyewitness accounts, reviews of the scientific evidence and almost 40 color pages of UFO photographs taken between 1975 and 1979. 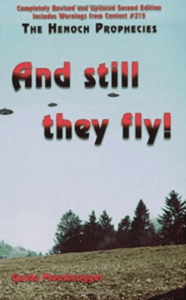 Moosbrugger’s extraordinary review takes readers directly into the world of UFOs and paranormal activity, offering an unflinching account of Billy Meier and his life as a contactee as well as in-depth information on extraterrestrial life, an overview of their technical capabilities and the reasons for visiting earth. And Still They Fly! is sufficiently detailed as to serve the reader who is contemplating a closer look into the scientific facts of the case, or one who is already very familiar with them. This second edition, entitled And Still They Fly!, was updated and expanded to include a new chapter entitled the Henoch Prophecies. These prophecies were given to Billy on February 28, 1987 and have never before been released to the public! The Henoch Prophecies warn of a looming World War III and mention by name, the countries that will be involved. With the ever-increasing change in the world situation, these prophecies, as a warning, offer us the possibility to change our thoughts and actions in order to avert a world-wide catastrophe.Includes 37 pages of full-color photographs! Once again I must bring myself to apologize to Mary and Suzy. 574. You will then be helpless and stand there alone – just as helpless as all those whom you have denied your help, thus they were not in a position to evolve themselves in appropriate form because you have let them hunger and thirst in spirit (N.B. material consciousness) and body. DECALOGUE/DODECALOGUE. NEW copies of And still they fly? My old book is falling apart, is this publication a better and harder cover? Sound Familiar? How’s about…60 Years Ago?